Just out of design school in 2000, my first job was with Tree Axis, a small studio in San Francisco, working under the designer and artist Stella Lai. This was at the apex of the first dot com bubble, when the internet was still new and novel, and tech hadn’t yet swallowed the entire world (and digested the city of San Francisco along with it). We did some really fun projects in both print and digital, including a ton of Flash sites, back when that was a thing. One of our clients was Telespree, a start up that had developed a “disposable” cellphone, which would be sold at convenience stores with a set number of minutes of talk time available (which could be replenished as needed by purchasing a new battery). The key to the product was voice-recognition software that ostensibly eliminated the need for a keypad—you would turn the phone on, speak the number you wanted to call, and it would connect. I don’t know if the phones themselve ever saw the florescent lights of a 7-11, but the back-end tech has been very successful, from what I understand. Our brief was to design a brochure highlighting the handset and making it cool and exciting. 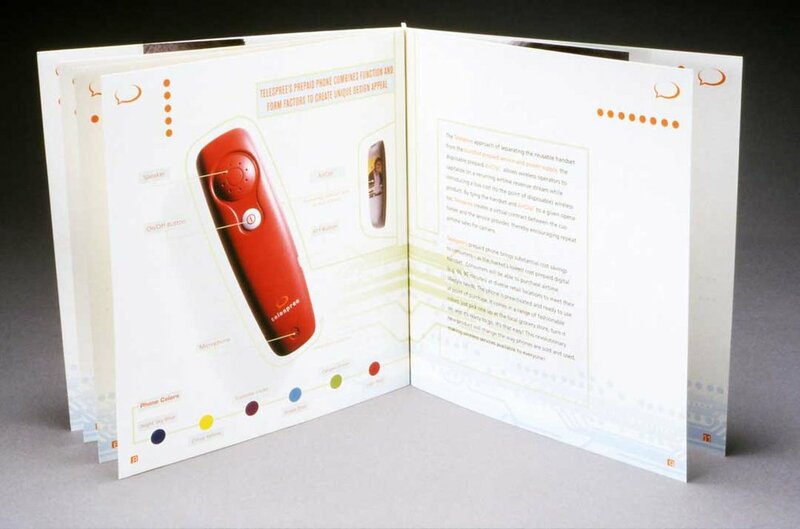 The client’s CMO was very interested in unorthodox formats, and we spent a lot of time together in print shops and binderies investigating possible formats, before landing on a grommet-bound square booklet with half-page inserts and spot varnish… those were the days! This was my first big project with a sizable budget, and I went all out, casting and art directing a blue-chip photographer to shoot Yes Duffy, a friend and early 00’s reality TV celebrity, holding a mock up of the product. The photos were printed on french-folded sheets bound into the booklet so that only half of his face was visible when the page was first seen, with the hand holding the phone on the overleaf. This project was a huge learning experience for me. As I recall, there was a problem with the way something had been set up, and some of the the pages had to be reprinted. In the end, it all worked out, and the client was happy. This piece was the anchor of my portfolio for several years. ** Some Fridays, I post an old project from my archive, along with the story behind it. As designers, we do so much work that was important to our development, but gets relegated to the dust bin of ephemera. In this series, I will share some of those projects, and the stories behind them.